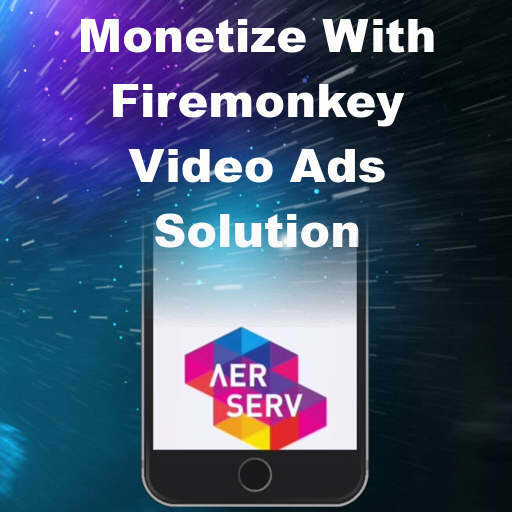 AerServ has released a monetization platform and video ad component solution for use with Delphi XE8 Firemonkey. One way to monetize your apps is through advertising and the AerServ components make that really easy to do in your Android and IOS apps. There may not be any ad support provided for the Windows and OSX platforms though. In addition to video ads AerServ also supports full screen ads and 320×50, 300×250, 728×90, 320×100 ad sizes. Two other features which make using AerServ attractive are their ad network mediation feature and their auction based aerMarket Ad Exchange. An ad exchange basically holds an auction for every ad shown and whoever is the highest bigger gets to pay you for that ad impression. You can use AerServ to rotate ads at the bottom or top of your ad screen and even display them full screen between app interactions. There are a lot of different ad networks out there but if you want to get up and running as fast as possible this makes it really easy to implement ads. The ad mediation system lets you tap into the other networks without having to implement each different network’s SDK. You should be able to use these ad components with Appmethod as well. You can download and install the AerServ ad components through GetIt. Head over and check out more information about AerServ before getting started monetizing your Delphi XE8 Firemonkey apps. On Seattle doesn’t compile for Android. Aerserv requires specific sdk and on seattle there’s newer installed by default. Complains that interface not found. For Delphi 10 try placing this code at the top of AerServCommon.Android.pas. It compiles but not sure if it works correctly.